3D printers are provided for use at the Chattanooga Public Library on Thursday, Dec. 28, 2017, in Chattanooga, Tenn. Though providing traditional access to books and literacy programs is still the library's core objective, they have expanded access to technology, music and crafts for the public. If you're a camper, cyclist, hiker, climber or paddler in Chattanooga's great outdoors, it's time to add another descriptor to your bio: maker. Gamers — the people who prefer a digital screen and controller to fresh air and exercise — know a secret about the Chattanooga Public Library that you'd be wise to learn. 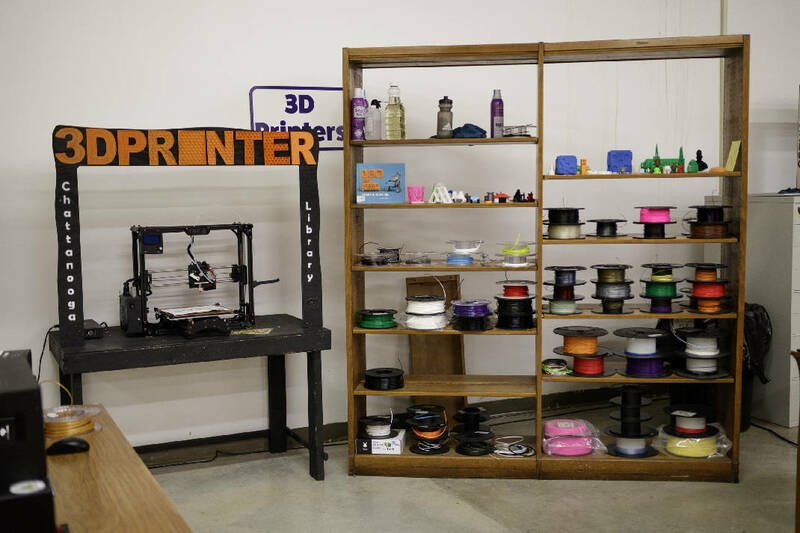 The 4th Floor at the downtown library is a mecca for makers, a place outfitted with an array of 3D printers, mold castings and other fabricating tools to make your own products — outdoor gear included. So far, the use of 3D printing is "mostly entertainment related," says Michael Grilo, who's in charge of the Makerspace, which opened in the fall of 2012. "People want to make a physical object out of whatever video game they're into," he says. Figures from "Minecraft," "Pokemon" and "Fortnite" have been popular — "whatever's big at the time," says Grilo. Chattanooga's outdoors enthusiasts have been less inclined to try their maker skills, though online sites offer multiple ideas for creating your own camping, backpacking and other gear with a 3D printer. As DigitalTrends.com advises, before you toss out your backpack, tent or camping chair because of a broken buckle or zipper pull, "you should look to see if your broken part can be replaced using a 3D printer." Among the site's recommendations? Carabiners, tent stakes and sporknives, the all-in-one eating utensil. We curated a list of designs from the many 3D-printable documents available. Visit getoutchattanooga.com for more. If you're not familiar with the process, 3D printing allows users to upload a digital file and "print" customized, three-dimensional solid objects layer by layer, mostly using bioplastics. The advantages of 3D printing over traditional manufacturing include the ability to print hard-to-find machine parts on demand or to print shapes not found in traditional manufacturing processes, according to a Chattanooga Chamber of Commerce publication. At the library, custom accessories to mount on bicycles have been the most popular use of 3D printing for outdoor gear. "Oftentimes these kinds of attachments don't take a lot of wear and tear, so plastic can be a great material to utilize," Grilo says. "I've also seen people 3D print custom climbing holds. The process might start by 3D-scanning a desired shape through photogrammetry, which is where you take many reference images of a shape and 'stitch' the images together into a 3D model." If the equipment sounds complicated, there's no need to be intimidated. The library staff can walk you through the process. "One of the main advantages of using the 3D printer over more traditional ways of fabricating is that the printer can pull off complex shapes that otherwise might not be possible to physically create," Grilo says. "3D printing also offers one of the quickest opportunities to go from design to prototype. "The downside to 3D printing is that it can take a really long time to print larger parts. Sometimes it's better to start with a solid material and cut away rather than slowly building up plastic. For example, something like a large box can take the 3D printer an awfully long time, but you could make it in minutes out of cutting and gluing wood or plastic together. "The biggest lesson I've learned at our Makerspace is that 3D printing isn't the best tool for everything, but it excels at being an empowering tool for quickly visualizing designs." Grilo says climbing holds, the grips attached to a climbing wall for climbers to grab or step on, are "a great example of how the maker movement has gone beyond just focusing on the 3D printer to incorporate numerous machines within a makerspace." "We might start a design on the 3D printer to quickly make a prototype that we can physically pick up and inspect, and then we'll move over to the CNC router to cut the same design out of a harder material. Or we might use the 3D print as the starting point for lost-wax casting of a mold in order to make as many copies of the design as needed, in whichever resin or material is desired. "Once you have a base model," he adds, "you can customize it depending on what kind of hold you need and what physical challenges you are working on." Mimic, a Chattanooga startup, is forging climbing holds using 3D scanning, 3D printing and 3D modeling technologies to mimic the organic forms created by nature. Founder Clayton Hardacre says the company can re-create a favorite boulder problem, make fully accurate training holds to mimic a challenge, and create perfectly mirrored organic shapes for balanced training. If you're more inclined toward DIY, Grilo can help. Creating 3D designs takes patience and skill, he acknowledges, but specialized websites make 3D printing ever more accessible by providing thousands of models that can be freely downloaded. A quick search for rock climbing on Thingiverse.com, which offers digital designs for physical objects, returns over 100 models that are ready to print, he says. The downtown library currently has three 3D printers, and the Northgate branch has one. They charge 6 cents per gram for the plastic, "which means that most people's prints are in the range of $1 to $3 and take two to three hours to print," Grilo says.